The end of the football season is an uncertain time for many in the football world. Contracts finish, transfer windows open and in my case there's a new edition of Football Manager and some major decisions to make. Naturally my playing career has been glittering with hundreds of games under my belt for such footballing luminaries as Wallace Primary School P6, Monday Night Muppets, Dukla CRD and Poynton Gentlemens Sunday Lunchtime Recreational Association Football Wanderers. There was even a game in 1994 when I was selected to play against Iceland (admittedly it was against Iceland the frozen food retailer and I was playing as a ringer for Littlewoods, not for Scotland) and *this goal at the Mecca of football that is Moss Rose Macclesfield. My virtual football management career has been similarly impressive with league victories with St Mirren (naturally), Leeds Utd, Fakel Voronezh, Macclesfield Town, Torpedo Moscow, Busan Transport Corporation and Stockport County amongst others. There's even been a Champions League win with Leeds. Now I have a copy of Football Manager 2011 installed on my laptop and am struggling to find a team to manage. Sometimes I start a game and it just doesn't "take". For some reason I just don't connect with a team and don't get the almost narcotic urge to play it. A game of Football Manager isn't a proper game unless every spare waking moment is spent considering what to do about cover for your right back and if your defensive midfielder will be fit enough for the league cup replay away to Arbroath or Anzhi Makhlachkala or Kettering Town. I'm not proud of it but will admit to being reduced to thinking about team formations and who should be on the sub's bench while I'm sitting on the toilet. At that point you have to accept you have a problem. This behaviour manifests itself in other ways. I have a dislike for certain clubs and players for things they have done on a computer game. I'm aware this is irrational but I will still never forgive Martin Rowlands for not signing for me when I was in charge of Stockport County. Airdrie United will always be a pariah club to me not for anything the actual club has done but for a late equaliser they got in a 3-3 draw while playing the 2002 variant of Football Manager. The inverse is also true. I have a fondness for relatively obscure players across the world because of performances they've put in on a computer game! In our house never a bad word is said about Marat Bikmaev, Nathan Ellington, Alexandr Pavlenko, Michal Gottwald or Peter Weatherson (even if Weatherson does now play for Greenock Morton). So now I have a new game and am looking for a new challenge, a new team, a new horizon. But where to go? Corinthians Paulista is an option to have a tilt at the Brazilian league and Copa Libertadores but Brazil has about 5 million footballers with approximately 12 names between them all. Persitara Jakarta Utara is nicely exotic but have you ever looked at the Indonesian league? Well no you obviously haven't because you're a well adjusted human being but I have looked at it and it's a Byzantine web of clubs nearly all called Persisomething. I thought about the A-League but couldn't find a club I liked the look of (no teams with black and white striped shirts for a start!) I even considered the MLS but lost the will to live when I came up against the MLS Superdraft. What in the name of goodness is a superdraft? Some sort of air conditioner? 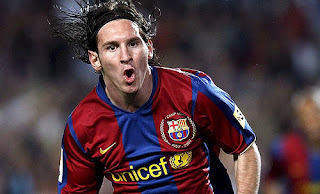 Messi - a poor man's Gardner Speirs? Following their demolition of Man Utd in the Champions League Final last week Barcelona have been touted as the greatest team ever. Obviously Barcelona aren't the greatest team ever, the St Mirren side of the mid to late 1980s were. End of discussion. Next topic please. Xavi Hernandez may well have a World Cup, European Championship, Champions Leagues and a liberal sprinkling of La Liga medals but is he not just a pale imitation of Tony Fitzpatrick? I mean Xavi couldn't carry off a 'tache like Fitz could. Leo Messi's dribbling and trickery may well make him the finest exponent of the game today but I'll bet he's not got as many Renfrewshire Cup medals as Frank McGarvey. And as for Sergio Busquets, let's put him up against Billy Abercromby and give Busquets a good reason to roll about holding his face. Or knee. Or nurse some massive internal injuries. Let's just say for arguments sake that you disagree about St Mirren's place in the football pantheon and we reopen the "who's the greatest" discussion. It's a facile and pointless discussion but it kills a couple of hours at the pub. I never saw the Real Madrid of the late 50s and early 60s play (I have a DVD of the 63 European Cup final but haven't got round to watching it so don't tell me the result) ditto for the Bayern and Ajax sides of the 70s. I did see the Liverpool side of the 80s play and while I confess to being very young all I seem to remember is Hansen, Whelan, Lawrenson etc passing back to Bruce Grobbelaar but I'm sure there was more to them than that. I also saw the Milan side of the late 80s and early 90s, van Gaal's mid 90s Ajax and now this Barca side. They were all great sides and all boasted fine players. I'd have to say that of the sides I've seen that the current Barca side is the best but is that just because I saw them most recently? Or because they play pretty football? Or because I have a soft spot for Barcelona? Who knows? For what it's worth I'd say that Barca play the game with a level of technical purity no other side has got close to (honourable mention to van Gaal's Ajax) even allowing for the likes of Dani Alves and Sergio Busquets' cynicism and theatrics. The other point about this Barca team is that it's also the core of the obscenely successful Spanish side which has swept all before them in recent years. Other club sides have strongly influenced national sides previously, Bayern and Ajax back in the 70s for instance but has a club side ever had such a big influence on such a successful national team as this Barcelona team has on the Spanish? Holland never actually won anything with Cruyff etc in the team and Bayern didn't have as many players in the West German side (I think) but Spain seem to steamroller team largely in a Barcelona style with largely Barcelona players. I'm sure older and wiser heads than I would scoff and say that this side isn't fit to lace the boots of the Honved and Real Madrid sides of the 50s or the tragic Torino side of the 40s and they may be right but this only proves what a pointless discussion it is. Apart from the hugely subjective nature of such a judgement the game has evolved so quickly and completely that it's almost a different sport compared to 20 years ago, never mind 60 or 70 years ago. The athleticism and speed of the game is higher now than it ever was and tactical innovations along with rule changes have made it harder than ever to score a goal. I'm sure that Puskas would be as fearsome player now as he was 60 years ago but just in a different way just as Zidane or Messi would be world class playing back in the 50s but they wouldn't be the same players. Puskas, Pele, Beckenbauer, Maradona, Campbell Money, Gullit, Zidane and Messi are and were all products of their footballing time and place and as such can only really be compared to their contemporaries for a value judgement. Comparing them against each other is as pointless as the "who's the greatest guitarist" debate, another staple of the pub bore.